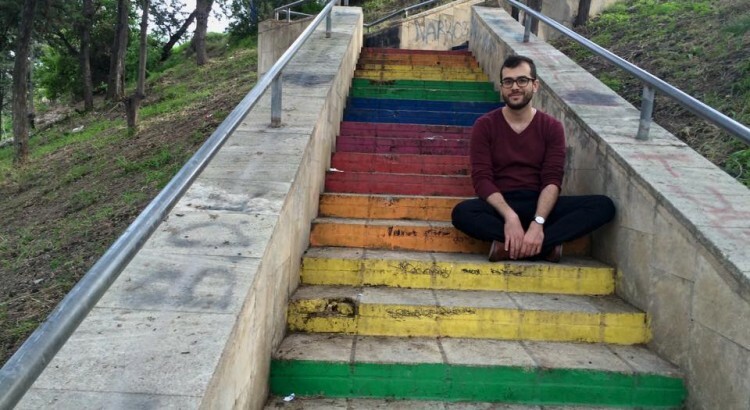 An interview with Mehmet Erdogan, Digital Communication Specialist at UNDP Instanbul Regional Hub, about UNDP Eurasia and their use of social media. 1. What kind of people following UNDP Eurasia on social media? We have quite a varied audience. We have a lot of development professionals and UNDP colleagues, but we also have activists and people who are generally passionate about human rights issues and want to make a difference. We have students who are interested from a research standpoint or those about to graduate and hoping to find a job. Demographics change from platform to platform – on Twitter a lot of our audiences are Western (Europeans and North Americans) but on Facebook we have a lot more people from the region. That makes sense – Twitter is less popular in the region than Facebook is. Across all platforms distribution between men and woman is almost 50-50% and most common age group is 25-34. On Facebook we have many English speakers but also a large number of Russian, Turkish, Albanian, Azerbaijani, Georgian and Arabic speakers. 2. How many different social media accounts are there in the UNDP Eurasia network? Because we have such a varied audience, we’re trying to keep our social media presence diversified (without spreading ourselves too thin.) Of course we start with the basics – Facebook, Twitter, Instagram – but we’re also posting longer pieces on Medium and photo essays on Exposure. Finally, we have a blog platform on our website, where we share reflections of our UNDP colleagues on their work. But it’s not just about having different social media accounts – creating accounts is easy. What’s more difficult is honouring what each platform is about and producing content that is right for that platform. If you’re simply copy and pasting from one platform to another, you’re not going to get a response back. 3. Social media is already quite saturated with content, both from other development agencies and also many news organizations with high digital budgets. How is UNDP Eurasia trying to stay on top? This is the question that keeps us occupied most. It’s not enough anymore to be simply caught up with social media trends – you have to be ahead of them. We’re a small team with very limited financial resources, so we’re trying to make up for it with creativity or else freshness in content. Do we have access to a region that others don’t? Are we working on a story that other organisations aren’t? It’s about identifying those opportunities and building our communications around them. We’re living and working in a world that is now primarily communicating in visuals so we have to push the envelope by going beyond reports and blog posts. We’ve also done major work in the last couple of years to switch from communications to simple storytelling. We know it’s personal stories that move crowds and motivate them towards action. We know if we tell a good story, it helps large amounts of information to become digestible for everyday audiences. That’s why we told the story of a Roma woman in comic form, or created a short video on an intersex activist. For March 8 this year, we told 8 short stories of 8 women in 8 different locations. We produced a TV spot with Turkish celebrities saying no to domestic violence. We want to go beyond simple numbers – we want to tell stories of people on the ground who are affected by or motivate the work we do. Now we’re exploring how we can use VR or 360 storytelling – we want to see if it can bring an additional freshness to the work that we do. 4. How many people are involved managing these accounts? We’re a small team of 4 people, including our team leader Nicolas Douillet. It’s primarily me in charge of our social media channels, but everyone contributes with content. 5. Please tell us about your new blogging platform and why it is important. 6. How does UNDP Eurasia use social media for accountability and transparency? You may have heard that UNDP has been named #1 for transparency on international aid two consecutive years in a row. So transparency is very important to us here at UNDP Eurasia as well. We use especially Twitter to share latest developments – when we sign a new project or receive aid from a country, we will publicly share the amount. We want to show that we take any grant and aid we receive very seriously. We also share donor information – social media makes it easy both to acknowledge the role of our donors in front of our audiences, but also to keep us accountable to our audiences in front of our donors. 7. How do you monitor feedback on all the various social media channels and how does this feedback influence your strategy? We’re trying to get better at listening to our audience. We are doing bi-monthly analytics round-ups to see what kind of content is getting bigger engagement. We’re monitoring comments and messages. But at the end of the day, we are a development organisation, not a corporation. We’re not selling a product. So we can’t completely let engagement define the kind of content we’re putting out there. We have an agenda that’s centered around promoting inclusion, human rights, climate action – we have the 17 goals part of Agenda 2030. So engagement can help us see if a particular type of content is or isn’t working well – could we have illustrated this issue with a photo essay instead of a blog post? What’s the length of video that works best on Facebook? Those are the kinds of decisions analytics helps us to make, but our core messages will always remain centered around the values of the United Nations. You can follow Mehmet on Twitter. A detailed interview with LeiLei Phyu, Social Media Manager at the UNDP. This is longer than my usual blog posts, but Lei has provided so much rich content and advice about the use of social media that I have left the interview in it’s entirety. 1. 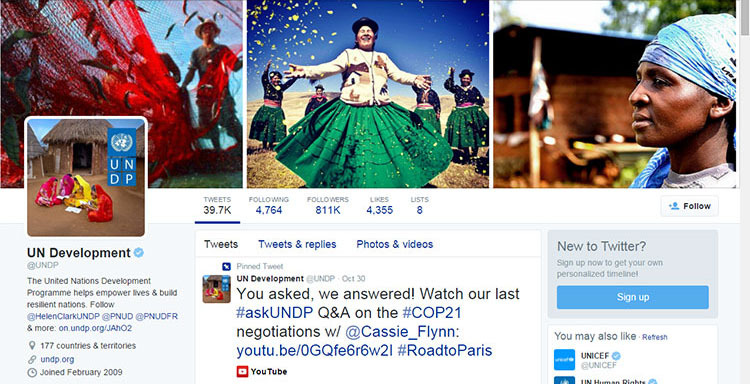 Why do you think that people follow the UNDP on social media? I think the majority of the people who follow UNDP on social media follow us because they are interested in the broader human narrative and our role in it. From our audience, community members who contribute and engage with us daily are big on advocating for social causes. They’re an informed and curious audience, especially interested in the impact narrative – stories of hope and inspiration – the kind UNDP works on such as the story about a nurse in Ghana who used mobile nursing to save the life of Faith, an expecting mom, who lived in Keta, off the coast of Ghana. Faith was a mother of three. Her town of 20,000 was stricken with cholera during 2014—heavy flood and changing climate patterns had dramatically affected the health of Faith’s town, which is a similar story for small communities like Keta worldwide. Especially during rainy season, Faith and the rest of the residents of Keta were cut off from the nearest major health centre. As a mom of three, pregnant with a fourth child, already showing symptoms of cholera, Keta was in no condition to travel far to reach the closest health centre in time. Access to information is the primary reason why our audience follows us. Using Twitter, Facebook, and Linkedin as a space to provide feedback on our programs and have someone from UNDP respond back is also a key reason. The general public, both from the global south and north, follow UNDP’s social channels on different platforms to learn about our work, our results, trends in key global conversations, about the issues that matter most to them such as climate action, gender equality, anti-corruption, social justice and youth action. Media and those who work in government such as parliamentarians and those who sit on Foreign Affairs Committees or are responsible for covering specific foreign policy issues follow us to keep tuned into trends in global affairs and sustainable development, especially new or emerging key development decisions, policies, results, data in reports, and our responses to global challenges. An ongoing example is the Climate Summit (COP21) happening later this year in Paris, as well as the next stages of the Sustainable Development Goals, which were adopted by world leaders a few months ago at the UN General Assembly. I started managing UNDP’s English social media platforms in October 2014. Before this, I had exclusively worked on crisis and disaster response and recovery communications and fundraising for five-years, when the role of social media began evolving globally both in driving social and political change (Arab Spring), in aid programming, and in the way UNDP communicates—social media’s role is very important in times of disasters and conflicts. 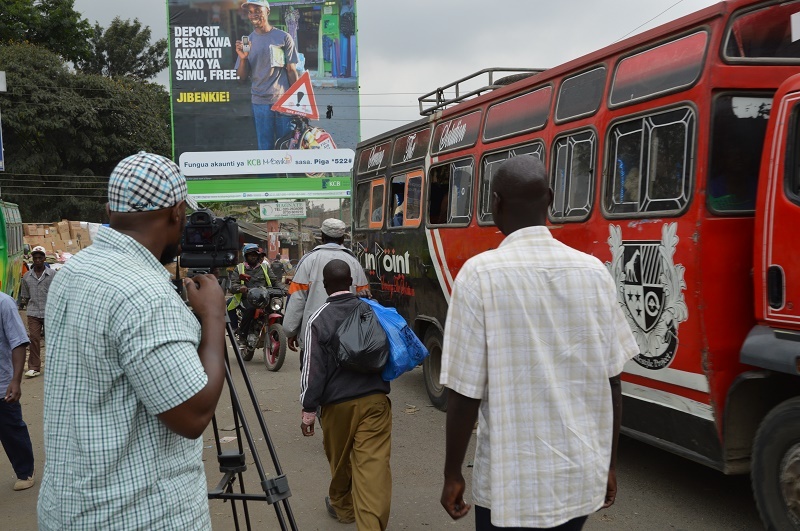 Social media gave organizations like UNDP a means to directly connect to the public rather than wait to be noticed. It’s an opportunity to be more approachable and rewrite our own narrative, break down mis-information, and show that for every negative story about those in the UN system, there are 100 undiscovered stories of positive action, and that behind these results, are amazingly talented and committed human beings who work very hard to improve conditions for the world’s most vulnerable. By not responding, by not engaging, because of a culture of risk-aversion, we run the risk of letting the myth or stereotypes and public perceptions of us become bigger and bigger monsters. The best way to address mis-information and chase the monsters away is turn the light on and reveal ourselves, who we are, what we do and how it makes an impact, what the steps look like at different phases of a project, and why you should care. Social media also opened up a way for the public to have a dialogue with UNDP and our staff directly through our global social platforms and through staff’s individual Twitter handles. Access to information remains a big part of our conversations with the public. On a given day, I respond to questions on how to apply for jobs, how to receive climate adaptation training or become a project participant – most times, people seeking answers to questions want to learn. In the past year, we’ve had farmers—one from the Philippines who needed advice on climate adaptation as the leaves on his coconuts were already drying up. 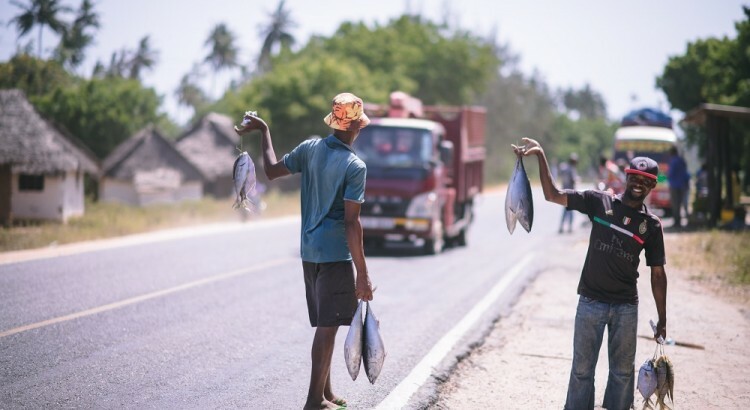 We were able to connect a youth fish farmer from Nigeria who faced the challenge of getting a loan and had put all his savings into starting his fish farm before weather patterns changed and his fish started dying. Students and journalists turn to us when on deadline to find data resources or information. Social media is transforming the culture of communications and transparency in the organization where often, no news comes out of projects until the project reporting cycle comes to term, a very technical status and budget report is sent to donors, and depending on the communications capacity (whether they have a dedicated communications staff in their office or not), we may or may not get a report or story about the project that may or may not sound more or less like a budget report. So social has challenged different parts of the organization to change specific processes so that we’re more accountable and transparent at every step of the process. This new demand requires skill sets and training for staff and skill sets. It sheds light on the capacity gaps that are systematic – the need for staff from all areas of work to be able to write effectively void of policy jargon and the need for capacity, especially in offices where a communications function maybe one of six functions a staff holds. We are part of a tree and the tree has to be healthy for everything to work right—I cannot tweet without getting quality stories that show impact and has a strong human narrative from fellow communications colleagues. They in turn need capacity, training, dedicated time and the full support and cooperation of their office to communicate, as well as a strong linkage with the project and technical staff who have the expertise, data and access to the communities who participate in our projects. 2. Who are your main audiences on social media? Do you segment any of your channels for specific audiences for example do you have more than one Twitter account? UNDP’s global communications office has a sub-team—the social media team, which manages UNDP’s global social media accounts in English, Spanish and French on Twitter, Facebook, Instagram, Linkedin (only available in English). What we prioritize on the global channels are the best of our work. We show development impact. We tell the story of transformation through the voice of the communities affected and the people who have found their lives changed for the better by our projects. We curate and re-write content pulled daily from over 170 UNDP offices, through websites, through exposure photo blogs, through YouTube channels, through Twitter and Facebook. In addition, I do quite a bit of monitoring of staff’s Twitter handles depending on the global news priority and trends of the day—if the whole world is talking about Syria on Twitter, I’ll go through our Syrian colleagues’ Twitter handles to showcase their take on their ongoing work in Syria. If the world is talking about kittens, I’ll pull out all the stories about endangered big cats living in protected areas we’ve had a role in establishing. For global accounts, we try to find that middle ground to tackle the diversity of our social community. Advocacy, education, ensuring accountability and transparency through open.undp.org data and thought leadership are priorities for messaging. For the general public, we’ve slowly started a series called #ABCdev which seeks to demystify policy wonk jargon into practical examples that anyone interested in learning about development will be able to appreciate. Data, results reports and updates on developing and ongoing work are key to our approach too. These are of vital importance for global media, government and development partners as well as the public—such as Syria, the current debate around the European migrant crisis vs refugee crisis, the war in Yemen. In the case of under-reported news such as drought in Papua New Guinea and drought in Vanuatu while the island nation is still recovering from Cyclone Pam, we raise light to conditions not covered in big media that profoundly affects the very existence of these communities . We shine the light on local heroes who bring amazing changes to improve their communities through our work. Our work aims to give people a boost up the ladder or give them the tools they need to flourish – the drive behind change are the determination of people who utilize those tools —whether it be women’s access to land rights in India or policies and technical processes that UNDP facilitates that leads to laws and groups that provide a structure and space for activists to pursue social justice—in Guatemala, Elena, a mom and a survivor of the civil war in the country. Her story starts with heartbreak. In 1982, when she was 12, she was raped by soldiers. 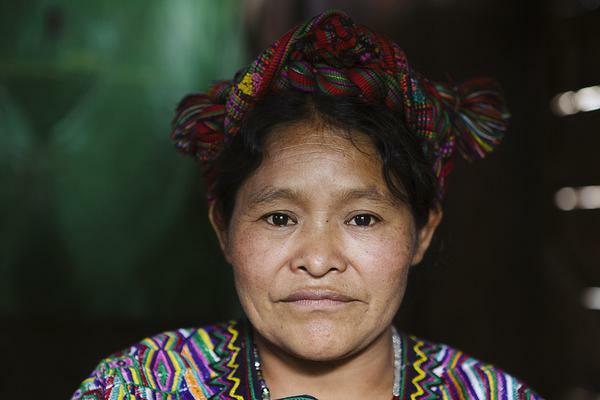 Elena grew up to become part of the first group of Maya Ixil women who made history when they testified again former President of Guatemala, Efraín Ríos Montt, for genocides and crimes against humanity. This case continues to be very contentious but in 2013, when Elena took the stand, it was a landmark case because it shed light to years of injustice and impunity. She’s a teeny, tiny petite woman—soft spoken, shy. Our UNDP Transitional Justice Programme may have paved the path but the true strength was Elena who said she had to do this, regardless of how much it put her in the spotlight or put her life at risk, because she didn’t want what had happened to her to ever happen to her children or any other human being ever again. Our amazing regional teams across five continents manage separate regional accounts. Our 170+ country offices maintain their own social accounts. They all have different sets of audience who are interested in regional issues or only about particular countries. 3. If UNDP could only use one social media channel, which one would you choose and why? All of our social media platforms are well loved for different purposes so that’s a very tough question. I love Twitter for the real-time interaction, behind the scenes feel, the challenge of getting up breaking news as it happens and for rapid information consumption. Twitter also challenges me to write better and think more strategically about key messages I want the audience to walk away with into a single tweet—only 20% of our audience actually clicks on our links for more information so the tweets have to be super tight and informative so they walk away with knowledge. Colleagues who tweet at work, especially those in the field, may not be fully aware but our small social team does check out their handle and read their tweets to pull content from and to feature their work—we love when colleagues embrace Twitter, get the “social” behind social media and start to develop a distinct voice and personality (what is also called brand identity). My favorite is still Facebook because I can really establish a relationship with our community. Those who engage with us on Twitter may change from day to day. But on Facebook, there’s a very dedicated community who engages daily, takes the time to read and give feedback. We see what they want to learn more of. We also see what doesn’t work on that platform (top down approaches, speeches, meetings). The audience who engages is dedicated, expressive, curious and I am able to have longer dialogues with them to answer questions, thank them for their support, or clarify mis-information. If the dialogue is constructive criticism, we try to maintain a dialogue to show facts—but that’s also linked to our capacity and workload because we do a range of other functions related to social that goes beyond content writing, curation and community management. 4. Access to social media in the global south has significantly increased in recent years. Have you noticed more interaction on social media with recipients of UNDPs programmes? Do you think it is an area of growth in the near future? We are getting more growth from Myanmar in the past year. The top countries where our audience are based in are India, Nigeria, Bangladesh, Pakistan, Kenya and Egypt. US is third. UK is 10th. India is 1st. Bangladesh is 2nd. Pakistan is 3rd. We aren’t seeing a rise in interaction with recipients of our programming but there has always been an organic growth in audience from programme countries—many are members of the general public who want to know if we’re being effective in their countries, want project updates and want to see impact, or want us to do more (sometimes on issues that go beyond our scope and mandate)-others want to learn about job opportunities and NGOs want to explore ways to become implementing partners or receive aid. We are actually struggling to grow our audience in the global north because reaching them and being accountable to the tax payers whose hard earned wages contribute to aid is vital. This is also a challenge that we are looking to tackle as we shape our new Communications Strategy. 5. Do you have a strategy to connect with more people in the global south via social media? If so what does it involve? Be social. Be genuine. Engage. Have empathy in your storytelling. Be human. We try to put ourselves in the shoes of our audience. Continue to improve upon what’s working so far but don’t get comfortable. Innovation is vital to social media –just staying relevant doesn’t cut it. These are challenges because of limited human capacity and budgetary resources. Getting support to procure new tools and enabling tools that will increase our productivity, time or resources to grow existing skill sets, having time to think of non-monetary incentives and innovative mechanisms that will nurture intrepreneurs in the organization to open up a culture of social media and effective communications is necessary. 6. Helen Clark, Administrator at the UNDP is a big advocate of social media. How has this helped with your strategy? 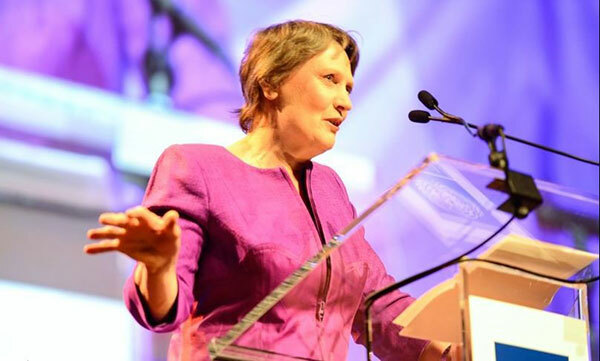 Helen Clark being an amazing advocate of social media has made all the difference with our strategy. She not only champions social media—she’s an avid champion of strategic and effective communications. This opens up the space for “converting” the skeptics when she leads by example, rather than when a younger, more junior staff like me attempt to go against the “this is how it is” approach to the system and lots and lots of bureaucratic red tape. Mila Rosenthal, our Director of Communications and Caroline Hooper-Box, our Deputy Director; both bring an amazing wealth of expertise and fresh perspective from having worked in Amnesty International, Oxfam and print media. We have plenty of positive disruptors and intrepreneurs with great, creative energy but we need more and more senior managers and established staff like our champions to push those doors open, nurture the creativity, and support a transformative culture of communications.